Slotted holes for universal use. Packed with installation screws. Slotted holes for universal use. Packed with installation screws. Replacement strikes for storm door latches. Fits 1/4", 3/8" and 1/2" strikes. Includes 2 shims. Visual-pack. Replaces jamb bracket for storm door closers. Compatible to the V1709 and V1346 door closers. Visual-pack. Replaces jamb bracket for storm door closers. Compatible to the V1709 and V1346 door closers. Visual-pack. Use on screen or storm doors for positive closing action. Steel construction with zinc finish. Polybagged. High strike offset. Slotted holes for easy adjustment. For wood or metal doors. Includes screws. Designed for doors and lightweight gates. Looped ends for installation. Does not include hooks. Boxed - Zinc plated finish. Designed for doors and lightweight gates. Looped ends for installation. Does not include hooks. Boxed - Zinc plated finish. Replacement jamb bracket for use with "Wright Products" Storm & Screen Door Closers (V820, SKU 164.5126, 548.9406), (V920, SKU N/A), (V1020, SKU 683.5631, 683.5706, 698.2185), and (VH440, SKU 639.7236, 683.6225). Use on screen or storm doors for positive closing action. Steel construction with zinc finish. Polybagged. Replacement jamb bracket for use with "Wright Products" Storm & Screen Door Closers (V820, SKU 164.5126, 548.9406), (V920, SKU N/A), (V1020, SKU 683.5631, 683.5706, 698.2185), and (VH440, SKU 639.7236, 683.6225). Length adjusts from 13" to 17". Use on screen or storm doors for positive closing action. Steel construction with zinc finish. Polybagged. 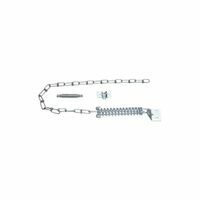 Spring door chain with hold-up and nail. Features high tensile plated steel spring and chain. Screws included. Die cast & steel rod. Visual-pack. Die cast & steel rod. Visual-pack. Die cast & steel rod. Visual-pack. Protects door and closer from wind damage. Includes wind chain and hold-up spring to prevent chain from hitting door and scratching glass. Mounting brackets and screws also included. Use on screen or storm doors for positive closing action. Steel construction with zinc finish. Polybagged. Designed for doors and lightweight gates. Looped ends for installation. Does not include hooks. Boxed - Zinc plated finish. Looped ends for easy installation. Four diameter sizes for various applications. Designed for doors and lightweight gates. Steel wire spring. Visual-pack. Designed to absorb shock, preventing wind damage to screen and storm doors and closers. Visual-pack. Looped ends for easy installation. Four diameter sizes for various applications. Designed for doors and lightweight gates. Steel wire spring. Visual-pack.